As we learned in the announcements made last summer, Disney will be opening a fully immersive Star Wars themed resort to go along with the new Galaxy’s Edge land that we’re getting next year. We got some new exciting details and I gotta say, I am so unbelievably excited for this thing you guys. These new details were just released at the D23 Expo in Tokyo Japan. Here’s what they’ve told us, (official press release here) and what I translate (or speculate) that they really mean. 1) You’ll have complete immersion into an authentic Star Wars story. Meaning nothing will pull you out of the story. You won’t be there thinking you’re in “space” and then pass a small window looking out over a parking lot. You won’t be surrounded by people dressed in space age costumes as members of the “galaxy” and then pass a cast member from Hollywood Studios walk by. Nobody does “fully immersive” better than Disney (visit Pandora for living proof of this) and this is something that will make this experience truly unique. 2) It’s a luxury class resort. Since Disney typically calls its top tier resorts Deluxe, does this mean it’s in a higher class than them? Interesting if so, but either way this place is going to be nice. And it’s safe to say it won’t be cheap. In fact, we better start saving now. 3) It will be seamlessly connected to Star Wars: Galaxy’s Edge. The resort will actually have direct transportation to Star Wars Land (Galaxy’s Edge). You won’t go through the typical entrance to Hollywood Studios. You won’t be leaving your transportation and queuing up for security with the other guests. Entering the park will be an extension of your story. Meaning any type of ticket scanning or security will be conducted as if you were in the Star wars Universe. I picture the ride queue from Star Tours. Remember when the droid has everyone going through the body scanner and he’s commenting on everyone’s luggage and stuff? What if entering the park was like that? Or at Universal when you move parks through the Hogwarts Express- the whole ticket scanning process is completely unique to the Wizarding World. Entering the train platform, scanning tickets, all themed to the land. Now imagine what Disney could do to make even a tedious experience like going through security a part of the overall magic. 4) To enter the parks you’ll board a Starship alive with characters and stories. Transportation to the park (which as we said will mean direct entry to Galaxy’s Edge) will be part of the experience as well. There’s been speculation that the new Gondola system that we’re getting would be used for this and I think this is extremely likely (just not officially confirmed from Disney yet.) The gondola’s are a large enclosed capsule suspended from a cable system that will move large numbers of guests from their resorts to the parks. (specifically Studios and Epcot) They would be ideal to completely enclose and continue the illusion that you are in a Starship travelling to the next Space Port. Again, making something necessary (and usually monotonous) part of the fun. The fact that there will be characters and stories on the “ship” sounds exciting too- maybe aliens and other residents of the Star Wars universe will be traveling along with you on the ship. 5) Guests immediately become active citizens of the galaxy and can dress up in the proper attire. You can’t be citizen of the galaxy in your Hawaiian shirt and crocs. You will need to look the part. What they’ll have available is anyone’s guess but I can’t wait to see what this means. Whether you’re just encouraged to bring your own things, or if there will be a room full of Jedi robes and various Star Wars inspired head gear for you to choose from. Whatever it is I AM IN. 6) Every resort window will also have a view into space. These aren’t going to be your standard hotel rooms folks. Expect everything, from the phone on the bedside table, to the robe on the hook in the bathroom, to be themed. If “nothing will pull you out of the story”, then that means everything you see will support the illusion that you are in space, traveling the galaxy. 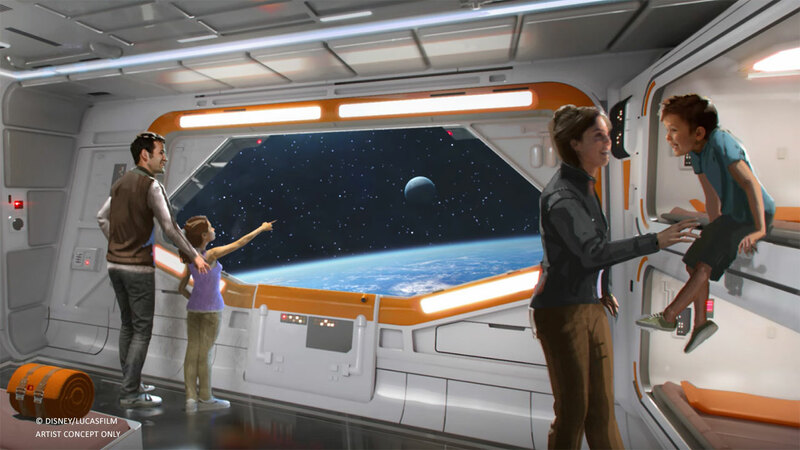 Every window will give guests the sensation of traveling in a starship while watching other ships and planets pass by their view. 7) The opportunity for immersion at this resort will stand out among all Disney resorts around the globe. There hasn’t been anything like this in any theme park, Disney or otherwise. They are completely rethinking the entire concept of a theme park resort and this, along with the new land, will be something people from all over the world will want to come visit. So are you stoked? I know I am! I can’t wait to see this new resort develop. If it’s half as cool as it sounds, it’s going to be so crazy popular that booking it will be nightmare but it will truly be the ultimate Star Wars fan experience. I’d love to hear YOUR thoughts on this. We have great conversations about all the big news stories over on my Facebook Page. If you haven’t yet, head over there and give me “like” so we can connect. To comment on this article, check out the post here.